Swindon Town manager Paul Hart has made his first signing by returning to former club Crystal Palace and bringing in striker Calvin Andrew on loan. The 24-year-old arrives on an initial one-month deal but could stay at Swindon until the end of the campaign. And Palace midfielder Alassane N'Diaye is expected to join Andrew at the County Ground on Monday for evaluation following a recent injury. Andrew could make his Town debut on Saturday against Dagenham & Redbridge. Hart, who replaced Danny Wilson as new Swindon manager, was keen to immediately add firepower to his squad as they battle at the wrong end of League One to avoid relegation. Swindon have scored just six goals in their last 13 fixtures and Hart was quick to stress his new team's need for a greater cutting edge in the final third. Andrew played for Hart at the end of last season for Palace and was pleased to grab the chance to link up with him again. "I got on with him really well, knew what he was about and trusted him to come down here and work for him," Andrew told BBC Wiltshire. "He's a good motivator and knows how to get the best from his players." 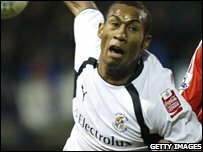 Andrew joined the Eagles from Luton Town for £95,000 in the summer of 2008 and has already been out on loan this term at Millwall, playing three games.